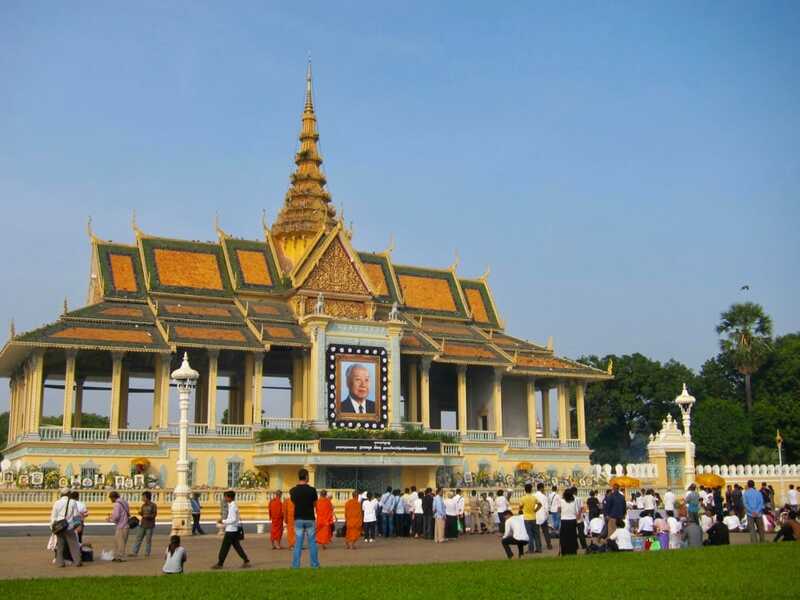 A visit to Phnom Penh, Cambodia is not complete without a visit to the Royal Palace, Chatomuk Mongkul. You simply cannot ignore it as a magnificent landmark especially during festive nights when it is fully lighted. 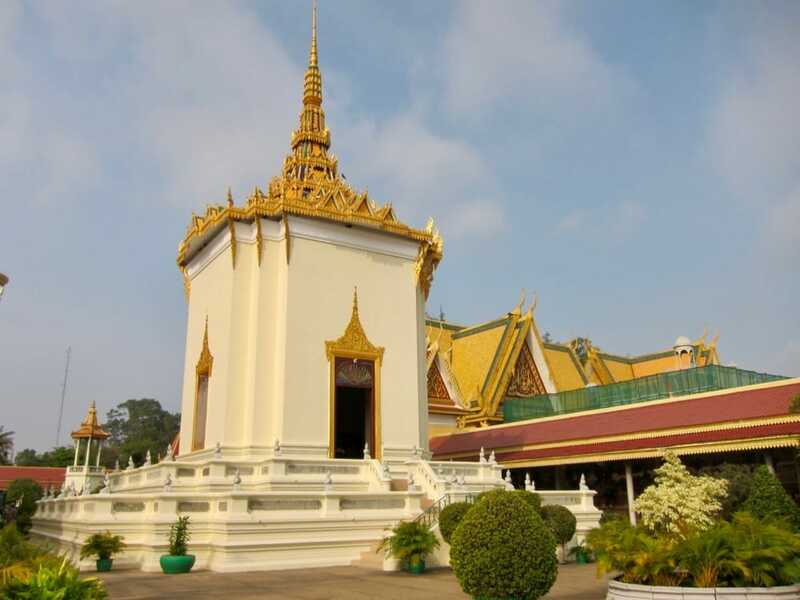 This official residence of the monarch of Cambodia was first constructed in 1434 but because, in the past, the royal family transferred seats several times, this first construction did not survive. The Palace as it stands now was constructed in 1866 when it was built close to the intersection of the four rivers, the upper and lower Mekong, the Tonle Sap and the Tonle Bassac. Thus, it was called Preah Borom Reach Veang Chatomuk Mongkul. 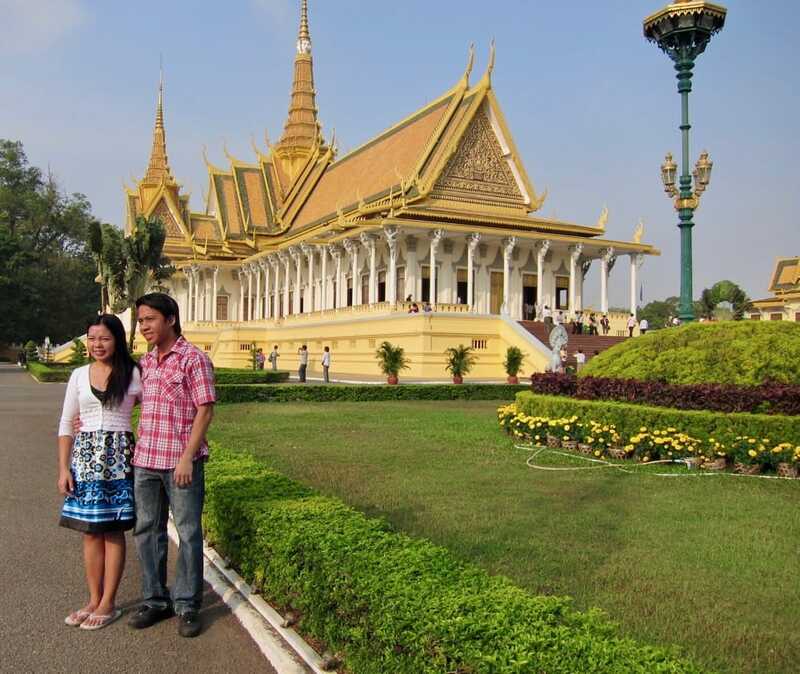 Built during the reign of King Norodom, this magnificent residence occupies an area of 435 by 421 meters. The architect, Oknha Tep Nimith MAK, followed the traditional Khmer architecture of tiered roofs and towers which symbolize prosperity. Originally in wood, it was later made concrete but this original Khmer form was preserved. The pavilions are painted in yellow and white. Yellow represents Buddhism and white, Brahmanism, two religions that have influenced so much of Cambodian culture. Built in 1917 by King Sisowath, this Hall is used for the royal coronation ceremony, the Tveatuosmeas, translated as the twelve month ceremonies, audiences granted by the Majesty, the King on national and religious holidays, the presentation of credentials by foreign envoys, and formal receptions for distinguished guests. This Throne Hall features some of the typical Khmer architectural details including the Naga Snakes, the Garudas and the Kinnoris. The stairway is guarded by the five headed Naga snakes and the pillars are decorated with Garudas and Kinnoris. Again, these symbols are from both Buddhism and Brahmanism. ​In the middle of the Hall is the throne referred to as Phnom Preah Somerureach, a hill where divinities live in the center of continents. A parasol covering this throne with 9 tiers, Preah Moha Svetrachhatr symbolizes the search of man for virtue until he reaches the top, Heaven and Peacefulness. Also known as the Moonlight Pavilion, this is where the King addresses the crowd and holds royal and state banquets. ​Constructed in 1913 under King Sisowath, this building has no walls to allow the moonlight to shine inside. It is used for classical dance performances or for special events such as speeches and banquets on special occasions. Built in 1892, it has been used mostly in the past by Khmer monarchs to listen to Ubosoth sermons given by Buddhist monks, meditate, venerate the Buddha or perform Buddhist rituals. The pagoda is enclosed with galleries painted with murals depicting the Khmer epic, Reamker. The epic begins in the southern part of the eastern gallery and stretches 604 meters. The Temple is so called because it houses the image of Buddha made in emerald. A small glass case enshrines Buddha's sacred relic brought from Sri Lanka by the Venerable monk, Loui Em who used to live in Wat Lanka. Because the floor is completely covered with 5329 silver tiles each weighing 1.125 kilograms, this temple is often called the Silver Pagoda. Inside the temple are 1650 artefacts, mostly Buddhist statues in gold, silver and bronze inlaid with diamonds, rubies, and sapphires. In front is a gold statue of the Buddha Preah Srei Arya Metreya (the Buddha of the Future) adorned with 2,086 diamonds, with the 25 carat one on the Buddha's crown. This building houses the royal regalia and other royal court ceremonial accoutrements. Among these ancient items of the royal regalia are Preah Moha Mokot Reach (The Great Crown of Victory), Preah Moha Svetrachhatr (The Great White Umbrella), Prah Khan Reach (The Great Sword), Preah Lompeng Chey (The Victory Spear), Kris (Dagger) Preah Soporbatuka (The Slippers) and Preah Veal Vichani (The Fan). This is also the pavilion where the Brahmans make dedications and offerings to the Hindu divinities and perform ritual for Shiva, Vishnu, Ganesh, Preah Chanti and Preah Kachayana. Constructed in 1915, this building stores the royal musical instruments and utensils used for the coronation ceremony. ​Now used as King Sihanouk's museum, it used to be the royal waiting room where they took a rest before mounting the elephant to bring them to the coronation. This holds statues of Buddha and that of the sacred bull, Nandin, found in Kandal in 1983 and said to be ancient in origin. Inside this building are fortune tellers who for a fee would be happy to tell you what's in store for your future. You need a translator, though. ​Originally constructed in Ismailia for Empress Eugenie during the inauguration of the Suez Canal in 1869, The Pavillon of Napoleon III was given to King Norodom by the Emperor so it was reassembled here in 1876. It is currently used as an art gallery of oil paintings, royal photos and other valuable objects of art. It has been closed recently for renovation and has not been opened yet as of this writing. Stupas of various monarchs and royalties adorn the grounds. These hold the remains of the royals. There are also smaller replicas of traditional Khmer houses where you can watch traditional silk weaving, perfom traditional Khmer music and play traditional instruments. ​Kids usually enjoy this part of the tour as they can try out their musical talent playing some of these unique instruments. Always worth a picture. Dress appropriately when you visit. Make sure your shoulders are covered and your pants or skirt cover the knees. Remove your shoes as you go in so if you don't like to walk on bare feet, make sure you wear socks. Get a guide so you understand better what you are seeing. Good guides often act as your security as well.